SANTE FE SPRINGS, CA –Goodman Audio Services joined Eastern Acoustic Works (EAW) Adaptive network with recent purchase of an Adaptive line array system. For more than 25 years, Santa Fe Springs, California-based Goodman Audio Services has provided corporate event audio for a client list that includes William Morris Endeavor (WME), Guess, DreamWorks Animation, 20th Century Fox, the Academy of Motion Picture Arts & Sciences and video game developer Blizzard Entertainment. The company recently joined Eastern Acoustic Works (EAW) Adaptive network with the purchase of an Adaptive line array system. Goodman Audio Services has been a long-time supporter of EAW with hundreds of EAW boxes in their inventory. 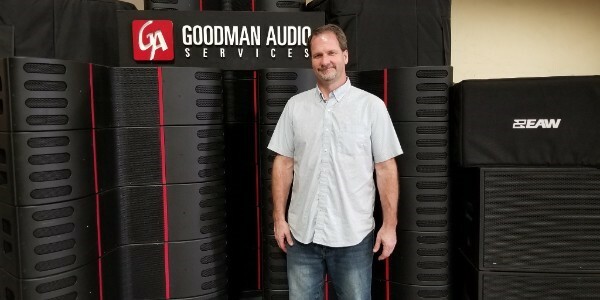 Goodman notes that the sound quality and durability of EAW systems has kept them a staple in his business.